In keeping with practice of the literary figures in town this weekend here for the annual Ullapool Book Festival I am taking time to revisit my notebooks and assess the words that I write while walking the strandlines. Today’s notes from Ardmair beach are almost an item for item copy of notes made on numerous beaches in the area. As the rain falls down on the van I begin chanting my way down the list which is becoming a repetitive strandline mantra……………..ROPE plastic ……… cap PLASTIC …… toothbrush PLASTIC…….. Crate PLASTIC ….. 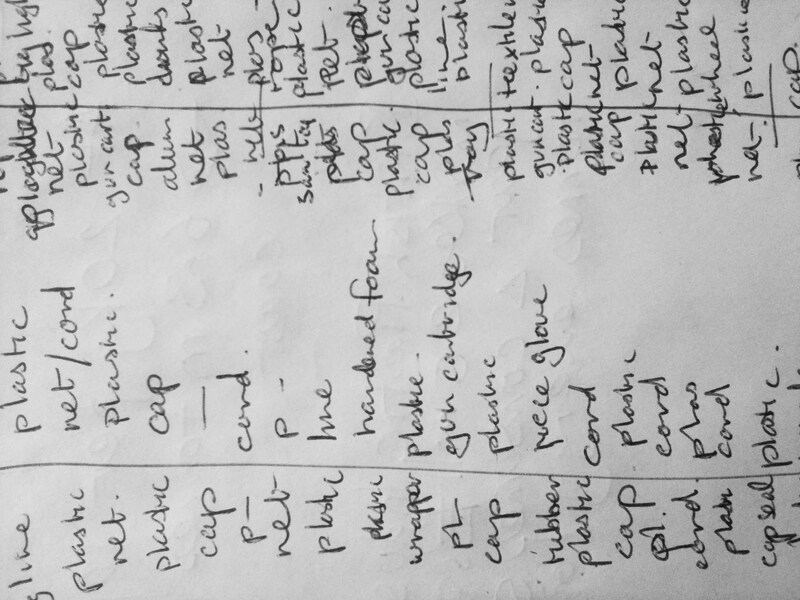 Bottle PLASTIC …….. cord PLASTIC …….Toy Plastic………….wheel PLASTIC …..BOX plastic……wrapper Plastic…..PLAstic sack…Ball PLASTIC….until I notice that Plastic is effectively a standard prefix for just about any object I use. Now in some kind of stupor I begin to play word games with my most used 7 letters. As the rain eases I shake myself out from the power of ‘PLASTIC’ and I begin to review the statistics I am beginning to amass on the material. If the average weight of plastic litter found on beaches is 20kg per 100m that equates to 6.3 million tonnes of plastic lying on our beaches.